"Lance Henriksen as a detective (Lucas) stalked by the reincarnation of notorious cleaver murderer/cannibal, Max Jenke (Brion James), he sent to the chair. The murderer returns to life through electricity (sound familiar?) and sets aim on the lawman's family. Max begins to manifest to Lucas within his own house, leading him to stab a turkey and shoot a television. When his daughter's boyfriend is found hacked up in the basement; Lucas lands in police custody. Lucas now knows what he must do realizing this is the best time for Max to seek his revenge. This film has some crippling problems. Henriksen and James are dependable as their usual badass personas. The rest of the cast are just standard stereotypes. You can tell the violence suffered significant cuts. One example is when Max "magically" attempts to rip out of Lucas' chest from within. Henrikson is seen obviously standing behind an effects piece of his gashed torso like something crazy is about to happen, but then he suddenly stumbles out of the room. Even some kill shots look zoomed in to avoid witnessing what would undoubtedly scar the minds of little boys and girls everywhere if the MPAA didn't save them. Beyond that, the conclusion is very jumbled. Locations mysteriously shift, characters die and later appear alive with no reason, and the nature of Max's being simply doesn't make sense. It's another for the "watch once" pile, more akin to an mildly interesting failure." I guess you can never take me at my word because I found myself hankering to revisit this "watch once, mildly interesting failure" and was presented with the chance to grab the "uncut" Japanese VHS recently. Like many late '80s slashers, The Horror Show fell under the mighty axe of an especially brutal MPAA regime who butchered the film far more than Jenke's victims. MGM/UA's tape reflects these R-rated cuts while Herald Videogram's Japanese tape and Hollywood DVD's British DVD present a "more complete" version (outlined over at Movie Censorship). I'm hesitant to say this extended version is truly uncut due to the film's troubled production after original director David Blyth (Death Warmed Up) was shitcanned shortly into production in favor of James Issac who worked fast to right the ship. Even more curious is how the double-sided Japanese cover depicts stills not found in either version. 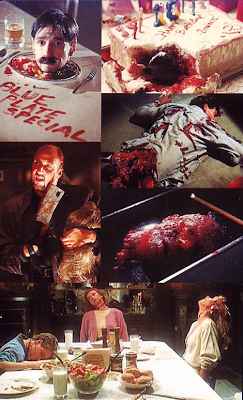 The collage to the left shows the second "blue plate special" severed head in the film of the only other man aware of Jenke's rebirth murdered and placed on a dinner plate. The thing is the character never once has a mustache. Maybe this was a gag crew photo? Or...? Bonnie's bloody 18th birthday cake is pictured yet the character doesn't have a birthday on-screen (can't recall ever hearing one even mentioned). Bonnie's slaughtered boyfriend is only mentioned later as being torn in half and not shown. I'm assuming this was meant to be shown after his torso falls in front of his screaming girlfriend. 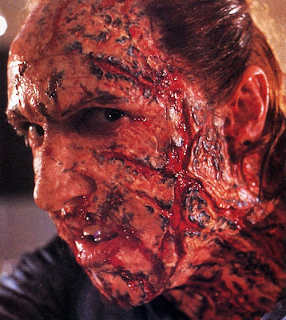 The deep fried head is only in the uncut version and the last two stills are in both versions. The front cover exhibits the biggest omission of Henriksen's Lucas pulling his chest open (to rip his own heart out?). As I originally noticed above, this scene is obviously edited in both versions as he only grips his hands on the edges of the wound before stumbling out of the room. This sequence is so sloppy that in one shot his fingers are bloodied while in the next they're perfectly clean. The meat grinder with legs dangling out next to him is only seen in the uncut version. The still of Bonnie screaming with a knife while her mother holds her is on the flip side and again isn't depicted in either cut. Jenke had a thing for Lucas's daughter so maybe there were scenes of Bonnie also having violent hallucinations of the madman like her father? Maybe she used the knife to cut into her birthday cake only to have visions of guts beneath the frosting? Or maybe her father freaked out again? Suffice to say The Horror Show seems to have suffered far more than what the ratings board managed to muster. It would be great to eventually see a SE DVD with detail into the production's woes, maybe even these scenes included somehow? As for the rewatch, I enjoyed this one much more, it doesn't flounder at its climax like Prison (1988) or feel desperate to create a new genre icon like Craven's Shocker (1990). I can honestly say I have never seen this...but, reading the synopsis and the cast...I will be looking up this adventure. Thank you for posting. Thanks! It's definitely worth finding, especially if you've seen and like the similar Prison or Shocker. Cool. Never heard of this one, but sounds like it's well worth seeking out. You had me at 'Lance Henriksen'... Cheers! It's streaming on Netflix (presumably through MGM). I don't know which version it is.